Content on this page is for informational purposes, and is not meant to substitute or replace qualified advice from your healthcare provider. Always consult with a licensed physician to see what treatment options are right for you. gammaCore is a non-drug, non-invasive vagus nerve stimulator (nVNS) treatment indicated for adjunctive use for the preventive treatment of cluster headache and for the relief of pain associated with episodic cluster headache and migraine in adult patients. It is also the only FDA cleared therapy for the prevention of cluster headache. gammaCore uses a patented electrical stimulation to gently activate your vagus nerve. The vagus nerve plays a role in regulating pain. Stimulating the vagus nerve can block signals that cause cluster and migraine pain. 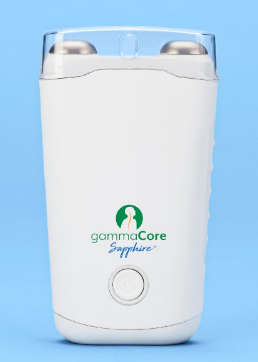 gammaCore Sapphire™, the next generation of gammaCore therapy, is designed for ease of use and comfort. Each gammaCore prescription lasts for 31-days. gammaCore Sapphire is activated monthly through a unique, prescription-only gammaCore Refill Card. Check out this video to see how to use gammaCore Sapphire. As part of the gammaCore experience, patients who have been prescribed gammaCore are invited to enroll in the gammaCARE program for support and resources throughout their journey. gammaCARE Call Connect: Talk with a Care Specialist who can answer questions about gammaCore, co-pay assistance, and how to use gammaCore Sapphire when you call 1-844-632-9264, Monday-Friday, 8AM-8PM ET. gammaCARE Text Program: Patients may text JOIN to 75686 to get helpful information on cluster headache, gammaCore reimbursement support, refill reminders and financial information or text FIND to 75686 to access Physician Finder. For more information about gammaCore visit www.gammaCore.com. *Terms and conditions can be found at https://gammacore.com/terms-and-conditions/. Available by prescription only. US Federal Law restricts this device to sale by or on the order of a licensed healthcare provider. References: 1. gammaCore Instructions for Use. Basking Ridge, NJ: electroCore, Inc.; 2018. 2. Silberstein SD, Mechtler LL, Kudrow DB, et al; ACT1 Study Group. Non-invasive vagus nerve stimulation for the acute treatment of cluster headache: findings from the randomized, double-blind, sham-controlled ACT1 study. Headache. 2016;56(8):1317-1332. 3. Goadsby PJ, de Coo IF, Silver N, et al; ACT2 Study Group. Non-invasive vagus nerve stimulation for the acute treatment of episodic and chronic cluster headache: a randomized, double-blind, sham-controlled ACT2 study. Cephalalgia. 2018;38(5):959-969. 4. Gaul C, Diener HC, Silver N, et al; PREVA Study Group. Non-invasive vagus nerve stimulation for PREVention and Acute treatment of chronic cluster headache (PREVA): a randomised controlled study. Cephalalgia. 2016;36(6):534-546. 5. Gaul C, Magis D, Liebler E, Straube A. Effects of non-invasive vagus nerve stimulation on attack frequency over time and expanded response rates in patients with chronic cluster headache: a post hoc analysis of the randomised, controlled PREVA study. J Headache Pain. 2017;18(1):22.